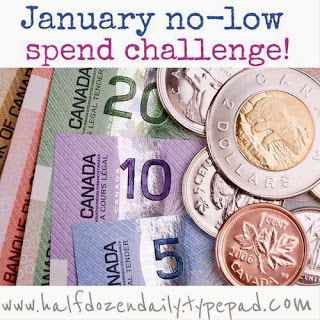 I wanted to update you on how the January no-low spend challenge is going for me. Now, remember, my goal is to save as much of my $200 allowance as possible since hubby does an admirable job with our household money. Week 1 (January 1-4) -- spent $18.95 to join Weight Watchers Online on January 3 using money I had saved for this purchase so I am not counting this purchase in the challenge. I meant to sign up before January 1 but it just didn't happen! Week 2 (January 5-11) -- I was paid $54.64 from Stampin' Up! on January 9; spent $25.98 on stamping supplies on January 10. Week 3 (January 12-18) -- paid $5.50 for crochet scarf pattern to make for friend's daughter on January 13. I am going shopping tomorrow but am hoping not to spend over $20. I try not to spend more money on stamping supplies than I make so I don't budget for that. Carla's challenge this week is to sell things we don't need but with my back issue I don't even want to think about it! I will just do the best I can with what I have. I promised an update on my Weight Watchers progress. My goal is to lose 20 pounds by April 1. I need to lose 35 pounds total but am setting the 20 as my first goal. In my first week with Weight Watchers Online, I lost 3.6 pounds--Whoo Hoo!!! I am hoping for an average 1.5 pounds per week. If you have been thinking about signing up for Weight Watchers or Weight Watchers Online, there is currently no sign up fee so that will save you $29.95 right there! This really turned into a bigger post than I had planned! Thanks for hanging in through the whole thing. I love this low/no spend challenge you are doing. I am tracking my expenditures and trying to do better in that department as well. Thanks for the inspiration. Have a great day! It is a challenge to not spend when there are sooo many sales this month! But I will keep plugging along! Good luck with your tracking and thanks for visiting. So far, so good! Losing 3.6lbs so far is awesome!! What a great start!! :) Keep up the great work! It will be easier when I can exercise again! Hopefully another week and I will be able to do some light exercise.